Economy and Trade Minister: "We lower our heads before no one, including Turks and Egyptians." 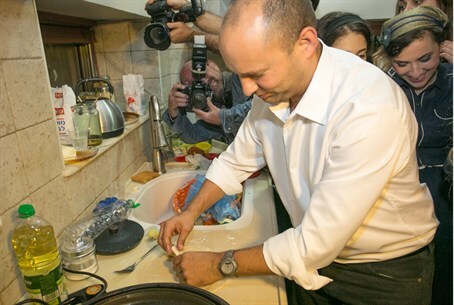 Minister of Economy and Trade, Naftali Bennett, took part in a Mimouna celebration at Netivot Monday. In comments he made there, Bennett tied between the Moroccan-Jewish holiday and current events. "My trip after the army service was to Morocco, and over there, in order not to stand out, after leaving the synagogue, one would take off his kippah and go home quietly," he recounted. "And we, in the state of Israel, no longer take off the kippot, and we do not lower our heads before anyone – not before Turks, and not before Egyptians, so that we will never have to lower our heads again." Netivot is a city in southern Israel located between Beersheva and Gaza, originally populated largely by Moroccan Jews who immigrated in the 1950s . At the end of 2009, it had a population of 26,700.